Where is Raja Ampat in Indonesia? Located off the northwest tip of Bird’s Head Peninsula on the island of New Guinea, in Indonesia’s West Papua province, Raja Ampat, or the Four Kings, is an archipelago comprising over 1,500 small islands, cays, and shoals surrounding the four main islands of Misool, Salawati, Batanta, and Waigeo, and the smaller island of Kofiau. 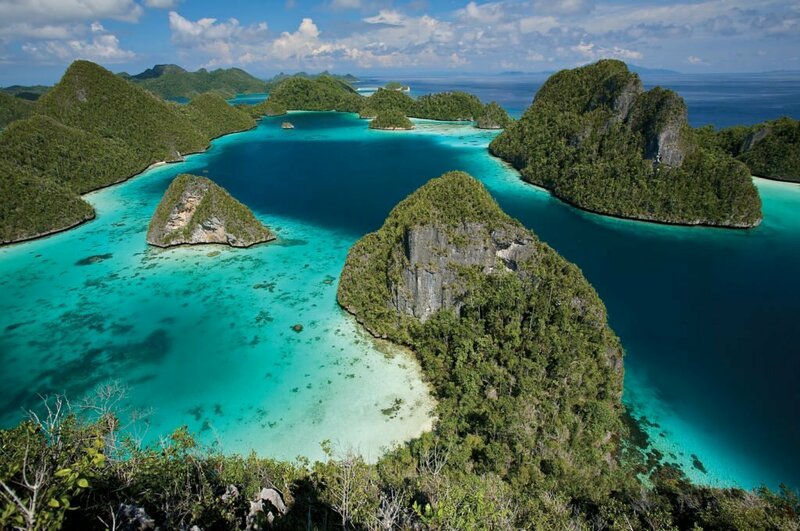 The Raja Ampat archipelago is the part of Coral Triangle which contains the richest marine biodiversity on earth. 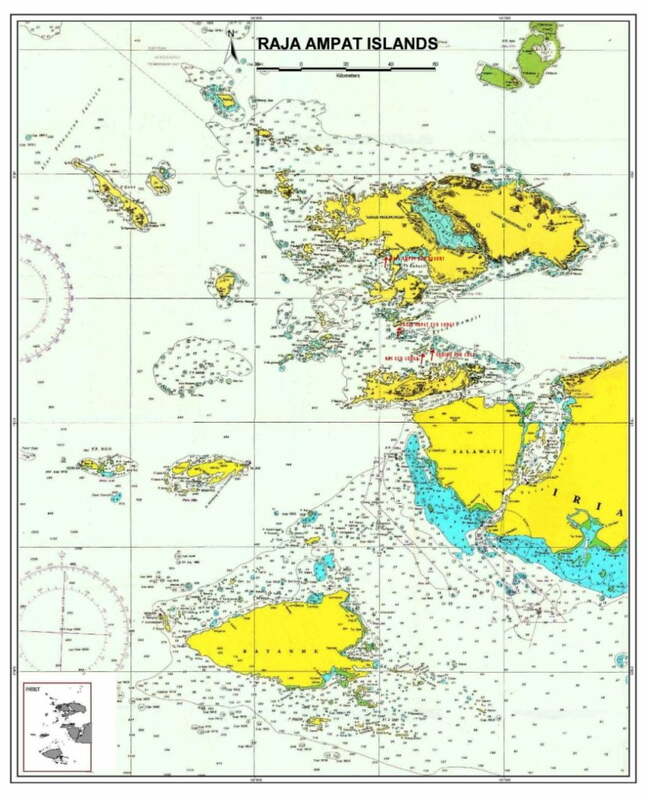 Most of the archipelago is in the Southern Hemisphere, with a few small islands northwest of Waigeo such as Sajang Island in the Northern Hemisphere. Possibly the world’s top destination for diving and snorkelling, Raja Ampat is a true diver’s and snorkeller’s paradise with crystal clear waters, massive coral reefs, and the world’s greatest marine diversity. Still almost entirely unpopulated and quite remote, these islands offer stunning uninhabited beaches and idyllic islands to explore at leisure, the perfect setting for a Raja Ampat luxury cruise. Whether you are a seasoned diver or snorkeler, or someone who is just starting out, you’ll be mesmerised by the sheer abundance of fish and the incredible marine biodiversity at every site. Raja Ampat is home to numerous species of sharks and rays including wobbegong sharks, reef sharks, epaulette sharks, manta rays, eagle rays and huge marble rays. It’s not only the big fish that are impressive though; the reefs are adorned with tiny jewel-like reef fish; dense schools of silvery fish occupy the blue; and for those who prefer macro life and intriguing critters there’s pygmy seahorses, an array of rare nudibranch, harlequin shrimps, flamboyant cuttlefish, frogfish and everything in between. For anyone who is looking for a luxury and truly tropical remote destination, Raja Ampat on board El Aleph ticks all of the boxes. This is a dream come true. Aquamarine bays, deep blue ocean, powder white sand, palm trees, lush jungle, unique wildlife and the finest liveaboard cruise vessel in Indonesia. 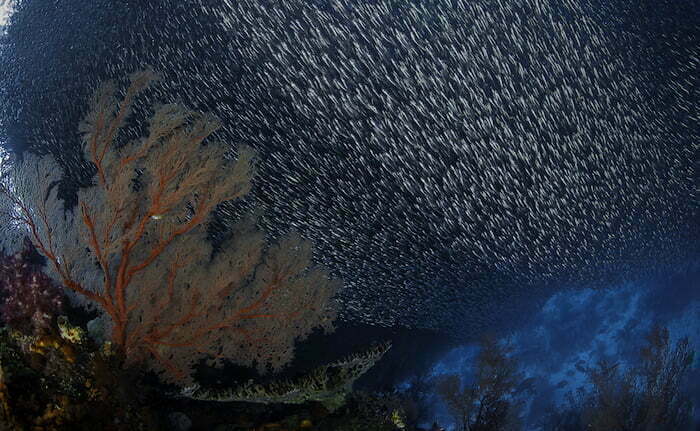 Raja Ampat is not only of interest to those who prefer to spend their time exploring underwater. 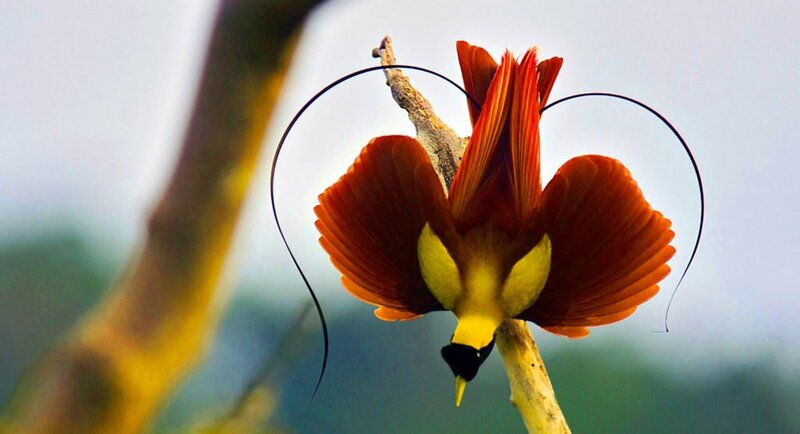 Bird life and wildlife in Raja Ampat is prolific and it is home to several species of Birds of Paradise including both the Red and Wilson’s Birds of Paradise. Other common bird species include: Lorikeets, Eclectic parrots, Kookaburras, Paradise Kingfishers, Glossy mantled manucodes, Cockatoos and many more. As some of Raja Ampat lays on the Australasian continental plate the flora and fauna of Raja Ampat has similarities to that found in Australia. 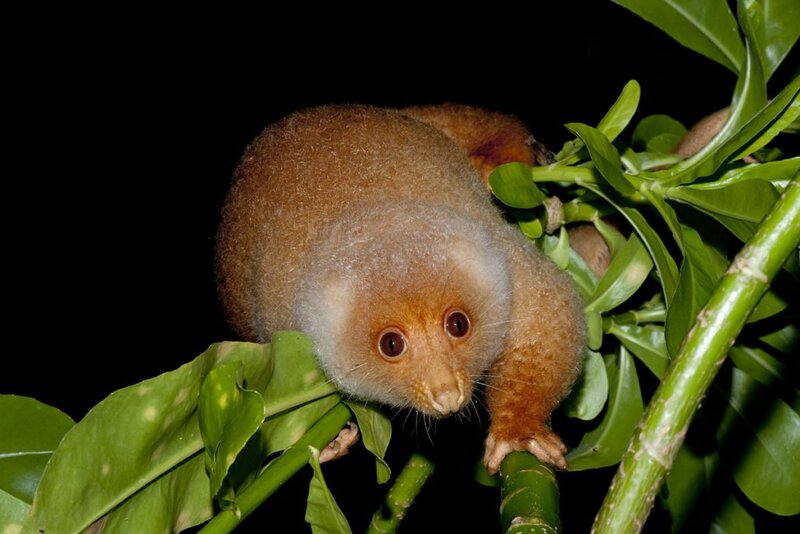 Raja Ampat is where you will also find the endemic cuscus (a tree dwelling marsupial), monitor lizards and coconut crabs. Raja Ampat is also an easy destination to link with the Banda Sea, Alor, the Forgotten Islands, the Spice Islands as well as Komodo for those planning a longer voyage. 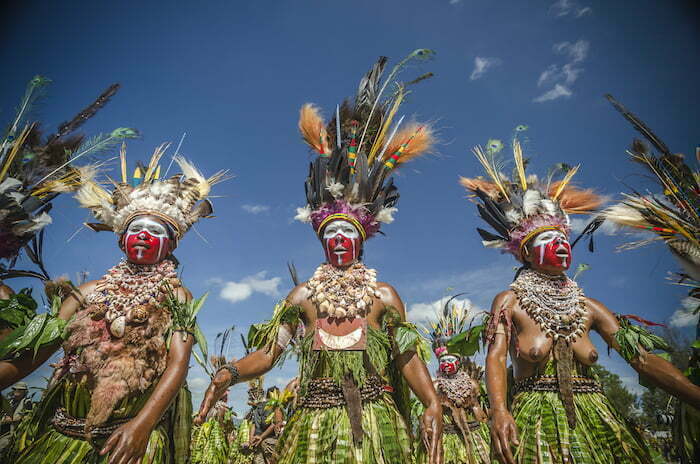 For those who really want to get off the grid and make a true voyage of discovery, a cruise of Raja Ampat and Papua New Guinea combined is highly recommended.